There followed a good five minutes determining, debating, and settling upon just what a snowman cake is. In the end we concluded that the Kids didn’t know what a snowman cake was, only that they wanted to make one. My wife baked a 13×9 sheet cake. Everyone helped spread on chocolate frosting. Good so far. And here’s where, if you’re making this at home, I highly recommend you STOP. Slice the cake and serve with a glass of cold milk or a dish of ice cream. You’ll thank me. We did not stop there however. Keeping with the ill-defined snowman theme the cake was assaulted with powdered sugar (don’t think dusted with; think dumped on). Next came colored sugar and leftover cupcake decorations. And why not pour on a quarter cup of sprinkles? For good measure. We had some chocolate chips lying around. On the cake they go! “Somethings missing. . .” The Kids muse. Yes of course, we’re missing smiley faces of M&Ms. And just in case any sweetness tried to escape (or a vegetable tried to nose its way in), the perimeter of the cake was ringed with a wall of marshmallows. 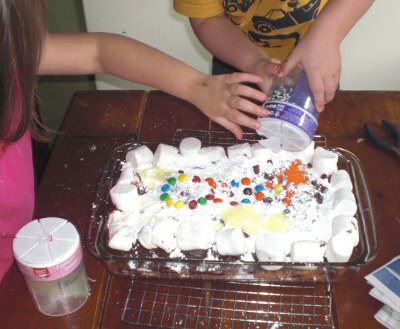 You might be thinking, “Why did you let your children put so much on top of the cake?” Two reasons: 1. Dancing in my head was a vision of some Hallmark / Norman Rockwell family story that would be passed down for generations. “Remember the time we made the 2,000 calorie a slice snowman cake?” 2. I do like deserts, and on paper this cake was adding up quite nicely. But, as you’ve no-doubt sleuthed, the cake was terrible. When we weren’t choking on powered sugar dust, the rest of the sweet lot was actively boring holes into our teeth. And naturally none of the Kids ate a marshmallow. Mostly they picked off the chocolate chips and M&Ms. Well, I guess in the end we might have ended up with a cherished family story after all. I’m off to the dentist now. We’ve had great success in the backyard garden this year. Cool temps + frequent rain = productive plants ∴ loads of yummy food. 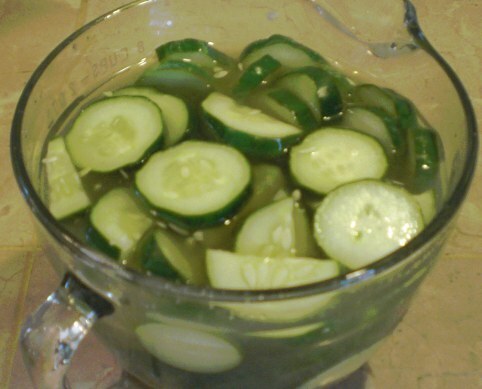 Pour mixture over 8 cups sliced cucumbers and let sit for a few hours. Remember fresh cucumbers = crisp pickles. 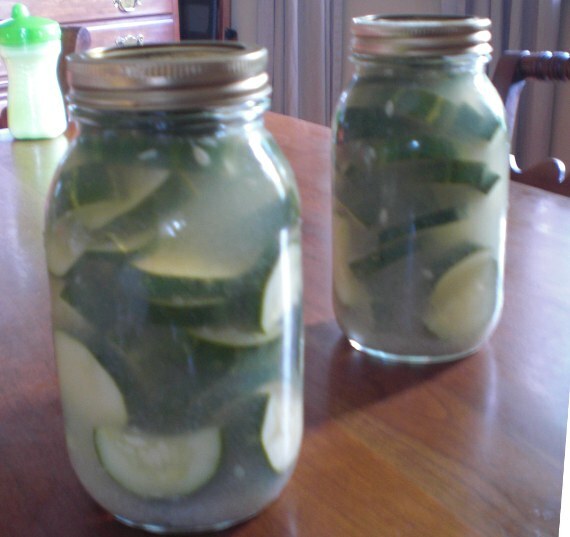 Cucumbers that have been hanging around getting soft = soggy pickles. Store in container of choice in your refrigerator. We went with canning jars, but anything will do. These pickles aren’t heavily salted like what you’ll find in the store, so they won’t keep for months and months, but – well. I know they last for two weeks (that’s how long they could survive before being eaten), but I think they’ll do fine over a longer period too. 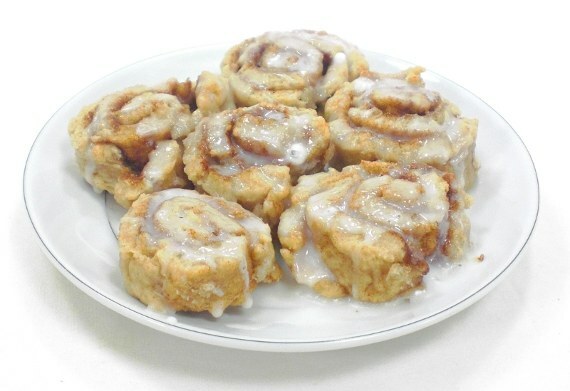 Love cinnamon rolls, but you don’t like the time it takes to make them? Leary of food that comes out of a tube? Mix 1-1/2 cups flour, 1 tablespoon baking powder, 1 tablespoon sugar, 1 teaspoon cinnamon, and a 1/2 teaspoon of salt. Add 3/8 cup of milk (use skim to cut down your calories but not the yumminess), and 3/8 cup oil. Mix well, toss some flour on the counter, and give the dough a few kneeds. Lean towards a moist dough – too dry and the rolls turn out too dry (go figure). If you have an assistant, have them mix together a quarter cup (or so) of sugar along with a few teaspoons cinnamon. Toss a little flour on top of your kneeded dough and roll flat with a rolling pin. 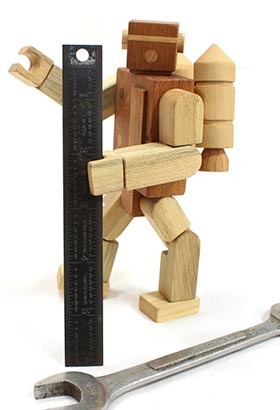 You want a 12-14 inch wide by an 8 inch wide long rectangle. It doesn’t have to be perfect – funny shaped rolls taste just as good as their handsome counterparts. Spread a capful of milk or a teaspoon of water on the dough. Add as much of your cinnamon sugar mixture as you dare (it will stick to the water or milk). Roll up your dough into a log – if you started with a 12-14 inch long rectangle, you should have a 12-14 inch long roll. Pinch the dough together and cut into 1 inch wide rolls (use a serrated knife to make your life easier). Please on a lightly greased 9 inch round pan. Bake in a 375 degree oven for 9 to 10 minutes. We use a toaster oven to keep that pesky warming up time to a minimum. If you use an oven, you should check on the rolls earlier just to make sure our temperatures jive. Either way, it’s important to err on the 9 minute side of things – cook those suckers too long and you end up with cinnamon biscuits. While your rolls are cooking mix 1 cup of powdered sugar with a teaspoon of milk to make icing. Add more milk cautiously until your icing is gooey and not runny. Drizzle icing just after the rolls come out of the oven and enjoy.